A shift in Thailand’s currency (THB) from Asia’s outperformer in 2017 to underperformer this year can be ascribed to the country’s falling trade surplus. Although just-released customs trade data for June does not entirely support this view, the cumulative data for the first half of the year does. We continue to see the USD/THB rate trading toward the 35.0 level by end-2018 (spot 33.5). 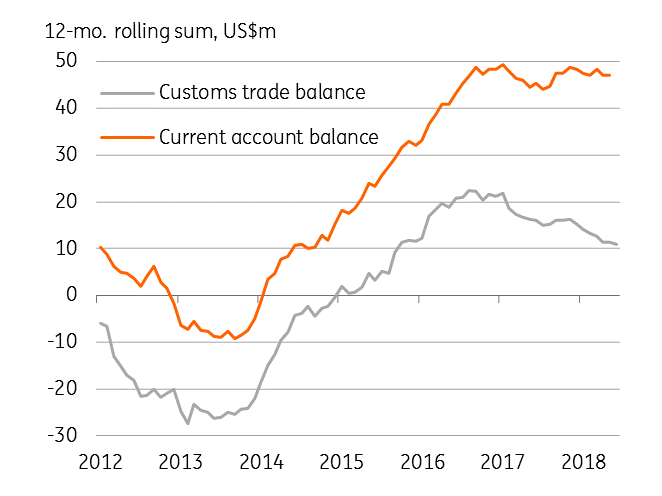 Beating the consensus, the trade surplus widened to $1.6bn in June from $1.2bn in the previous month; the consensus forecast was $1.3bn, while we were expecting a small deficit. Exports grew by 8.2% year-on-year and imports by 10.8%, though both fell short of the 11% growth registered in May. Electronics and autos have been the main export drivers this year, whereas fuel has been the dominating commodity on the imports side. However, the cumulative trade surplus of $3.5bn in the first half of 2018 has more than halved from the $7.6bn surplus of a year ago. Trade balance drives the current account balance. Indeed, the $17.3bn current surplus in the first five months was $1.4bn less than a year-ago. After a strong run in the last four years, Thailand’s external payments have started to weaken this year and foreign exchange reserves have started to fall after peaking over $215 billion in March. These trends are here to stay as the global trade war threatens exports and confidence-sensitive capital inflows while rising oil prices boost imports. We forecast that the annual current surplus in relation to GDP will narrow to 7.5% in 2018 from 10.6% in 2017.